Dental Regular Peanut | All Things Woof Meow, Too Inc. 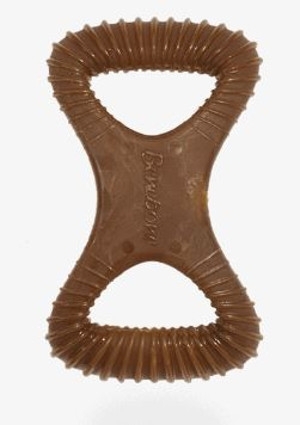 The two ribbed ends of the dental chew are designed to stimulate teeth and gums. It also makes for a good tug toy. Benebones are made with USA-sourced nylon and flavored with USA-sourced real ingredients – real peanuts, white meat chicken, or bacon. That’s it! We like to keep it simple. Note that because all of our products are made in a factory where nuts are used, avoid introducing any Benebone product in a household with an allergy to nuts of any kind, pork, chicken or nylon. Made-in-USA ingredients your dog knows and loves. We hope that you and your four-legged family members are inspired by Benebone’s curiosity, enthusiasm, and optimism.